We all know that moving can be a major stressor, especially when the move involves leaving a longtime residence for a much smaller home. Downsizing can be daunting. 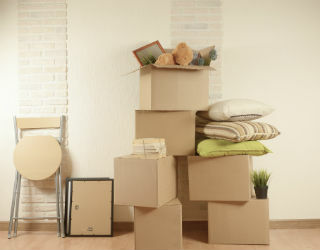 Experts advise that, when possible, start planning your downsize move long before the date. In that spirit, this spring, Kendal at Oberlin brought together a panel of experts, including “been there, done that” residents, to share stories and suggestions. To listen to a series of audio recordings of the downsizing event, click here. Podcasts are available here. “I’d like to give you three reasons why you need to talk to realtors to be part of your rightsizing conversation. No. 1, you could really use their experience and expertise. “You know, these transactions are some of the biggest transactions in your lives. They can help you with knowing what your property’s worth, but also keep you up-to-date on the market data and when to place it on the market. “They have expertise on how to market your property and advice on how to show your property to attract buyers. They will use consultants when necessary, such as stagers and professional photographers. They can even advise you on repairs and connect you with a local contractor that will address some of those outstanding issues. They understand contracts. They will help you with all the complications of property disclosures, inspections, things that go into making a transaction happen. “No. 2, make the realtor part of your process and timelines because they are. Get them to put together a rough schedule for you so you can anticipate next steps. Make them part of the conversation that allows for relationship building, and they can help you keep track of your process. “They can also keep you updated with market activity. You can be set up for notifications. A lot of my sellers like that, even if they're planning on a move five years from now. They get updates on what's going up for sale, how much it's going up for. When properties go contingent, how much they actually sold for. So, that way they're not calling you every day, but you get that information when there's a change in your local data. “They see your house through the buyer’s eyes, they are the voice of the buyers and they can help you prioritize based on what the buyers will see. And if you're lucky, a realtor that specializes in your local market may already know several buyers that are seeking the kind of house you have, and whose timeline for buying matches with the timeline that you have for selling. Ted Forthofer, owner of Moves Made Easier, helps older adults age in place or move to a smaller house. A tape measure is his best friend. “I didn’t actually bring this as a prop, but I was down the hall measuring somebody’s room this morning for preparation for a move, and that’s exactly what we do. We measure this new space. We measure the wish list of furniture and things that might be touching the floor that you would like to have moved. And then we sit down and do it on computer and do a computerized-to-scale layout of your things in the new space. “Kendal, where we do a lot of work, is a little bit different. We find a lot of future residents do that themselves with the graph paper that facility services provide and the little cutout to-scale pieces of furniture. Because really knowing what's going to fit in advance and only planning to move those things is critically important. I'm always amazed at how many people choose to move first and downsize later. “We actually go to the extent of measuring closet rods and totaling them all up. Say you’ve got a cottage or an apartment with 20 linear feet of hanging clothes space: We bring the two-foot wardrobe boxes to pack your clothes in. We’re going to bring 10 of them, and if they fit in those 10 boxes, you can bring them. If they don’t, you can't because they're not going to fit. “Same thing with kitchen cupboards. That’s critical. We kind of convert the old and the new kitchen cupboard space to cubic feet in order to say, ‘Well, you need about a 50% reduction in your kitchen utensils, sometimes more.’ You have to lower your targets to maybe making lunch, breakfast, reheating things as opposed to Thanksgiving dinner for 10 people. So, a lot of the roasting pans, the crock pots, maybe not quite appropriate for senior living. Gary Olin and Sally Nelson-Olin, both retired clergy, had lots of experience moving, but they faced their biggest challenge when they downsized from a 3,100-square-foot house to a 1,100-square-foot cottage at Kendal. Sally explains their approach. “You need tools – a tape measure and spreadsheet. Next, a camera. Doesn’t have to be fancy; just your phone if you’ve got a camera in your phone. Areas that you will use as staging areas – places where you don’t have a lot of stuff and a lot of activity such as a spare room. “Folding tables, big tables to put things out on; the floor plan for your new, smaller place. Floor plans are really important, and you can get them online. Planning ahead, end result – knowing where each piece of furniture is going to be. “A scanner. Scanners for slides, scanners for negatives, scanners for individual pieces of paper, scanners for photographs and so forth. A scanner will be your friend. A home inventory app. This is good anyway for insurance purposes. There are all kinds of little apps for a smartphone or your computer where you can put in whatever you have and you have an opportunity to put in dimensions, and the source, and the value of these things. “We had post-its, or little sticky dots, different colors so that when family or friends said, ‘I want that,’ they each got a color and they got to put a sticky on the things they want. They won’t want very much, but it’s nice to know what they do want when they want it. “Then inventory taking. This is where we went around the house and measured every piece of furniture that we had. We recorded the dimensions. There was a place, a column on the spreadsheet for that. So you have by room, the item, the dimensions, there was a column for the significance, like Uncle Ralph made this whatever, the chair. “And then a column that says keep, sell, or donate. What are you going to do with it, the disposition? “I have three questions, and the answer to these three questions is ‘not really.’ The first question is did we sell anything? Not really; nothing that we had was really that valuable, and so not really. We gave it away.